Wedding is a ceremony where the bride and the groom tie the knot, where people unite to celebrate, and on this auspicious day no one wants to get dressed like a dog's dinner. Hence, for the men, especially the groom it becomes important to choose the right way to dress. As the wedding bell rings, be it the groom or his male friends, all they think about is the amazing groom tuxedos. A man in a tuxedo adds panache. It has taken an eminent place in the power structure of formal wear for men, and it truly brings a manlike gentility. It is a timeless fashion that is opted by most of the men to multiply their handsome look. Prices are the first thing that any couple would give attention to. Low cost yet an elegant look is what everyone needs in the present generation. No one wants to pinch their pocket so hard for a single occasion. A proper fit is an important element when it comes to dressing the men. There are gobs of places where Wedding Tuxedos are available to make a man look extra masculine. These dinner jackets are available at a very low price in a variety of colors and styles that matches their personality. Our website gives you exactly the look that you want. Available at a reasonable price yet stylish and comfortable is what our website gives you. To make your hanger look scintillating, it is important to do some homework before buying. 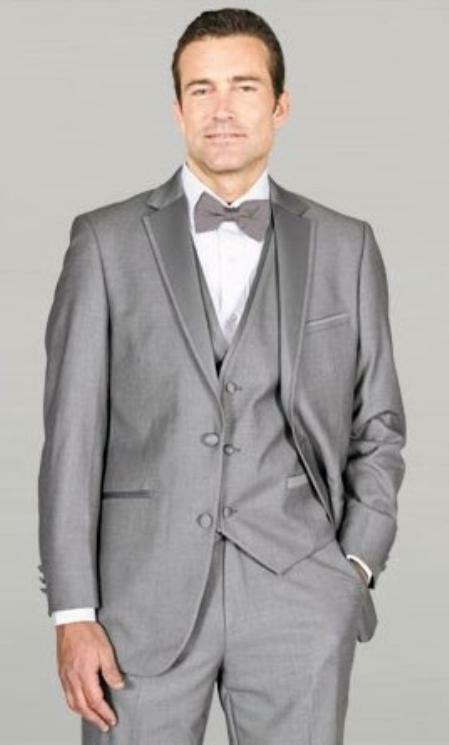 Tuxedos has lots of varieties like single breasted, double breasted suits, one button, two button, three button, four buttons, white tuxedo suit, and off white tuxedo suit. So, a man should opt for dinner jackets according to the height, body type, the occasions to be attended, and other needs. The number of buttons on a tuxedo depends upon person to person. There are different types of lapels like notched lapel which is considered as least formal lapel style, shawl collar which is a rounded lapel, and peaked lapel which is broad and v-shaped. Ready to get the eye catching look? Men who do not prefer to spend a humungous amount on a tuxedo, can easily get that fashionable, jaw-dropping look at various outlets or can even shop online. Be it a prom, evening party, or a wedding, it serves the purpose.Groom Tuxedos come in black and white which includes black pants, black jacket, black tie and a white undershirt. Teaming it up with proper accessories like cummerbund and bow tie sets, neck ties, formal gloves and scarves, suspenders, top hats and dress socks available in various colors can work wonders. Our website provides you all the accessories necessary to team up with Groom Tuxedos. If your calendar is alerting you for any special event then take a look through various cheap wedding tuxedos stores to make your evening exceptional. To make a groom look as impeccable and flawless as the bride, an outfit for the groom is important to complement the experience of the ceremony. Thus, these dinner jackets will always be in fashion as it gets adapted to any occasion.